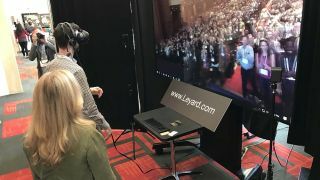 At the sold-out TEDx Portland event on April 15, attendees were treated to a virtual reality experience of a standing ovation from the TEDx stage enabled by Panogs, Dot-Dot-Dash, and Planar, a Leyard company. The day began with a 4K capture of 360-degree video and audio of the full auditorium on their feet clapping. Throughout the day, visitors used HMD (head mounted device) VR headsets and headphones to experience what a standing ovation would feel like for a speaker on stage. An output of the HMD was fed in 4K to a Planar QE Series 98-inch display for the gathered visitors queuing up for the experience. Attendees commented that the experience was very realistic: their cheeks would flush and they would feel compelled to react to the crowd that was on its feet and cheering in the 360-degree video. TEDx is an independently organized event under the license of TED and 2017 was the seventh year this sold-out event has taken place in Portland, OR.